The Thistle group is the most primitive of the Composite family, and it bears evidence of a vast evolutionary history. There are one hundred and seventy-five living species, which are distributed over Europe, Asia, Africa, North and South America. The plants seem able to adapt themselves to almost any conditions, and their unpleasant spines are found bidding defiance to the reindeer near the Arctic circle, as well as successfully measuring strength with the prickly cactus and acacias of the tropics. On our own prairies only plants thus armed stand much show to survive the herds of cattle that wander over them, and this protection, together with their great productiveness, have rendered thistles such a nuisance and menace to agricultural interests as to necessitate legislative action looking to their extermination. The Russian and Canadian thistles are the worst offenders, and where they once obtain a foothold they, as a rule, remain. 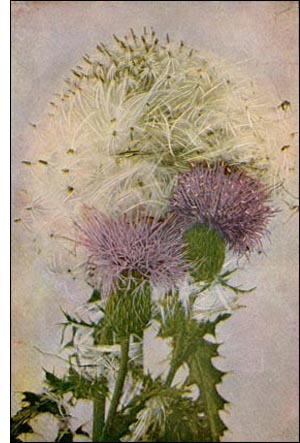 The unpleasant qualities of the thistle, however, served to bring about its adoption as the national emblem of Scotland. The story relates that during the eighth century the invading Danes, while stealing up to the Scotch camp under cover of darkness, passed over a patch of cotton thistle and the sudden cries of the injured men warned the guards, and thus the army was saved. Achaius, King of Scotland, adopted the plant as his emblem in recognition of this service, but it was not made a part of the national arms until the middle of the fifteenth century. The origin of the Scottish order of the Thistle, or St. Andrew, is somewhat uncertain. In 1687 it was restored to favor by James II. of England, and was given much prominence during the reign of Queen Anne. The membership was limited to from twelve to sixteen peers of the realm, the insignia being a golden collar composed of sixteen thistles, from which hung a St. Andrews' cross.